Alma Afrobeat Ensemble is a modern band that plays Afrobeat and more. They are based in Barcelona, and the 8 members are from 8 different countries, thus mirroring the international nature of Barcelona itself. Their music draws of course on the legend of Fela Kuti, but includes influences such as the Talking Heads, Curtis Mayfield and Santana. Their groove is constant, but without sacrificing the ever important craft of well composed songs. 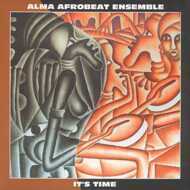 "It's Time" from Alma Afrobeat Ensemble!! !